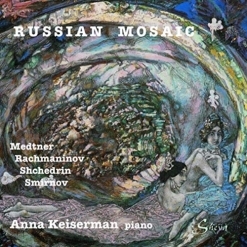 Russian Mosaic is the very exciting debut album by Russian-born pianist Anna Keiserman. A collection of lesser-known solo piano works by Sergei Rachmaninov (1873-1943), Nikolai Medtner (1879-1951), Rodion Shchedrin (born 1932) and Grigory Smirnov (born 1982), Dr. Keiserman provides an in-depth look at these four composers from her native country while dazzling the listener with her flawless and extraordinarily expressive playing. Russian Mosaic is available from Amazon, iTunes and CD Baby.